Posted on 23 July 2010. RAID stands for Redundant Array of Inexpensive (or Independent) Disks. I prefer to call them Redundant Array of Independent disks because they use to be very expensive. A RAID array is a set of multiple hard drives that make up a data storage system built for redundancy or business continuity. In most but not all configurations a RAID storage system can tolerate the failure of a hard drive without losing data however this ultimately depends on how the RAID array is configured. Each RAID level have pro’s and con’s and it is up to a network administrator to decide which RAID level is best for a specific situation. There are many factors to be taken into consideration and it boils down to Speed – performance and budget. Here are some examples of some of some common RAID configurations or RAID levels. RAID Level 0 provides no redundancy whatsoever and is completely foolish to use in a business environment for storing critical data. With a RAID 0 configuration if one hard drive dies the entire RAID array dies and you can kiss all of data on the RAID array goodbye when this happens. RAID 0 is usually popular with computer video gamers that only take performance into consideration and RAID 0 is usually twice as fast as other RAID levels. Re read this paragraph before considering using RAID 0 it to store your precious data. 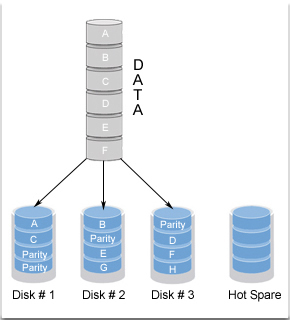 RAID Level 0 splits or stripes the data across drives, resulting in higher data throughput. Since no redundant information is stored, performance is very good, but the failure of any disk in the array results in total and complete data loss. Raid Level 0 is only used to increase hard drive performance. A RAID 0 configuration uses 2 hard drives and you get the storage capacity of both of the hard drives. Example if you have 2 100 gig hard drives then you get 200 gigs of NON redundant storage space. RAID Level 1 is usually referred to as hard drive mirroring AKA a mirror. 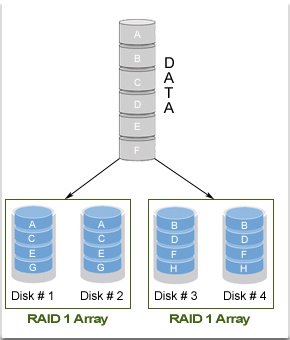 A Level 1 RAID array provides redundancy by duplicating all the data from one drive on a second drive so that if one of the two hard drives drive fails, no data is lost. RAID 1 is very good for small businesses because it is affordable and reliable. A RAID 1 configuration uses 2 hard drives so if you have 2 identical hard drives you get the storage capacity of 1 of those hard drives. Example if you have a pair of 100 gig hard drives then you get 100 gigs of redundant storage space. RAID Level 5 stripes data at a block level across several drives and distributes parity among the drives. No single disk is devoted to parity. This can speed small writes in multiprocessing systems. Because parity data is distributed on each drive, read performance tends to be lower than other RAID types. The actual amount of available storage is about 70% to 80% of the total storage in the disk array. The storage penalty for redundancy is only about 20% to 30% of the total storage in the RAID 5 array. If one disk fails it is possible to rebuild the complete data set so that no data is lost. If more than one drive fails all the stored data will be lost. This gives a fairly low cost per megabyte while still retaining redundancy. A RAID 5 configuration uses 3 or more hard drives. If you have for the sake of an example, 3 100 gig hard drives then you get approximately 200 gigs of actual storage capacity. Raid 1+10 is commonly known as RAID 10 and is a combination of RAID 0 and RAID 1 – mirroring. What this means is you have 4 hard drives, 2 sets of the hard drives are each on a RAID 0 configuration and are then mirrored together on a RAID 1 configuration. 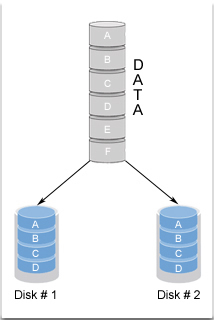 Data is striped across the data mirror which provides both high performance and redundancy together. Any one of the hard drives can fail without data loss as long as the data mirror is not damaged. The RAID 10 array offers both high speed data transfer (write speed) advantages of striped arrays and increased data accessibility (read speed). System performance during a RAID rebuild drive is also better than that of parity based arrays, since data does not need to be regenerated from parity information, but is copied from the mirrored hard drive to another. Now that you know what RAID is and what common RAID levels are used today never ever assume a RAID system is a backup solution because it is not. An Orlando computer consultant can help you decide which RAID level is best for your business or organization. Don’t ever just blindly purchase a server without the guidance of a professional network administrator. Without professional guidance you may go overboard and waste money on a RAID system that you don’t really need or you may wind up getting a RAID system that offers no data protection at all. What is a Microsoft Small Business Server? and do you need one for your organization? Posted on 02 July 2010. What is a Microsoft Small Business Server? What is the difference between a Small Business Server and a single role server? Here is a simple non technical explanation of what a Microsoft Small Business Server is and is not. After reading this article you will have a better understanding so lets get started. Larger companies such as fortune 500 or fortune 100 companies have many servers that do different things. Let’s pretend that “some big company” has 40 servers and each server has its own role to do something specific for the computer network. In theory this would mean that this company has 40 separate physical servers setup in a room to control the computers for this company. In today’s world this would be consolidated using server virtualization but that is getting off topic so I’m not going to get into that in this article. Now let’s pretend you are a small business owner and you need a file server + a SQL database server + an exchange server. Ok so this means you would need 3 physical servers + 3 different server operating system licenses and many of other things and this can get expensive quickly not to mention an experienced network administrator to design, configure, deploy, test and manage this for you. Now with a Microsoft Small Business Server Operating System you get 1 physical server that has multiple server roles built into 1 nice neat package. So you can have that file server and that database server and an exchange server and that web server all combined into 1 neat little package. This can save the small business owner money IF the server is properly configured and maintained. Microsoft states the SBS – small business server will support up to 75 computer users / workstation computers. In theory this will work but in the real world if you have 75 computers connected to a SBS server you can expect very poor performance. From my experience I will say that Microsoft SBS servers are pretty cool IF they are properly configured with the right hardware and software. I have seen many small businesses have an SBS server that were NEVER configured correctly or are just being used as a simple file server. In such a case the SBS server isn’t necessary and is a waste of money for the business owner. So without getting into technical details this concludes what a Microsoft Small Business Server does. 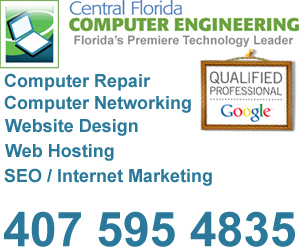 If you are thinking about purchasing a new server for your business get to know an Orlando computer consultant and find out if a Microsoft Small Business Server will benefit your organization.